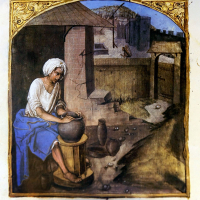 The potter’s wheel is already thousands of years old. It’s an amazing invention that allows the potter to work meticulous and fast. Nowadays, many potters are accustomed to the electric wheel to produce their wares but some prefer the old-fashioned human-powered wheels. I’m one of the latter. 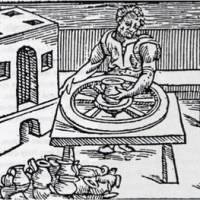 Since I started making medieval pottery, I have been curious about the development of the medieval kick wheel. How does my modern kick wheel compare to its medieval ancestor? 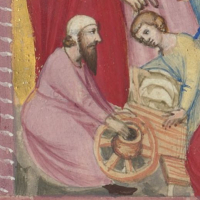 How is a medieval potter’s wheel constructed and how would the construction influence its use? 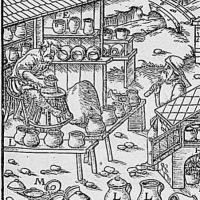 Apart from these questions, I had the ambition to give throwing demonstrations to show how medieval pottery was made. 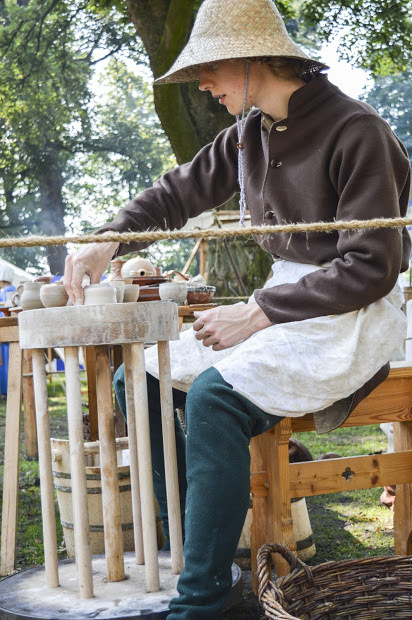 A reconstruction of a medieval potter’s wheel could possibly answer my questions and provide me with the proper tool for my demonstrations. I decided to dive into experimental archaeology. This my account of that experiment. Some foundations and pits of medieval wheels have been excavated. They provide us with information about the size, material and location but no medieval wheels are sufficiently preserved to give a complete image of the shape and construction. 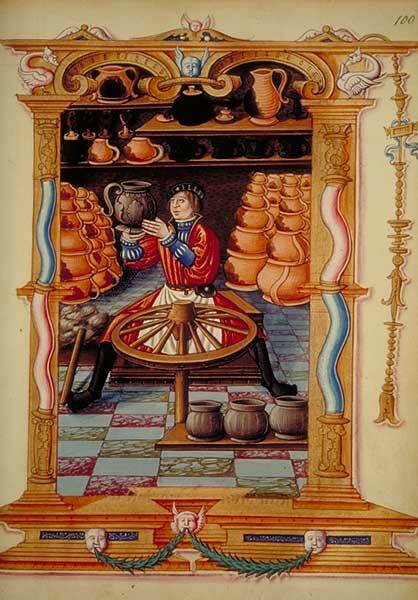 However, many images of the time show the medieval potter’s wheel in its full glory. 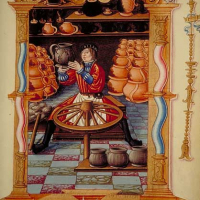 It seems like there were two main types of wheels in use for pottery in late medieval Europe before 1500. One was a hand-turned wheel that largely resembled a cartwheel with the axle fixed vertically in the floor (images 2 to 11), the other was a kick wheel that looked like a standing spool on a vertical axle (images 12 to 20). Some of the cartwheel images show wooden sticks beside the wheel or in the hands of the potter (images 2,3,5,8,9,11). These sticks must have been used to speed up the wheel. 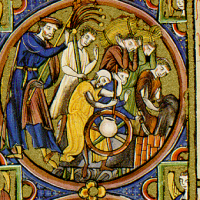 Other images suggest that the wheel is accelerated by hand (images 4,6,10). Image 7 doesn’t illustrate either way, here the stick is used by Nigidius to draw lines on the flywheel to prove a point. The kick wheel is rotated by pushing the wheel with a kicking motion of the foot, just like my own modern kick wheel. 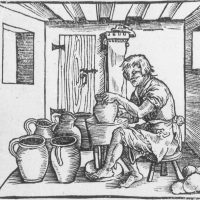 Potters are often depicted with at least one foot close to the flywheel, as if they’re about to give it another swing. They often work with bare feet, maybe to keep their shoes clean and whole but presumably to get a better grip on the flywheel. 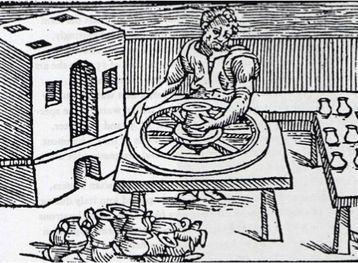 A third type of wheel emerges in the course of the 16th century, for as far as I can trace it down. The construction is more or less identical to my own modern kick wheel. 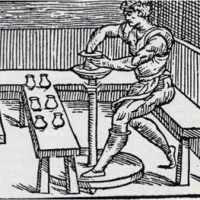 The oldest depiction known to me is from De la pirotechnia by Vannaccio Biringucci, published in Venice in 1540. Here, the kick wheel has a construction built around it that provides a place to sit and a shelf to place tools, clay and finished vessels. 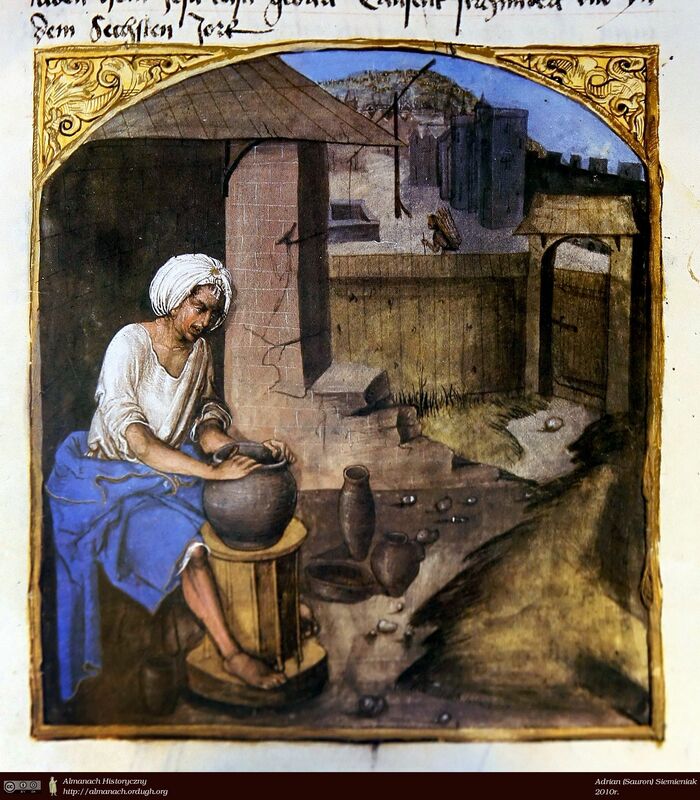 These pictures give a wonderful insight into the daily practice of the medieval and post-medieval potter. But they tell us little about the materials, bearings or construction methods that were used for the wheels. 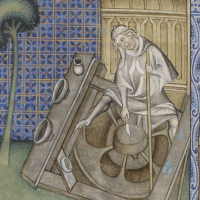 In this experiment, I focused on the construction of the medieval kick wheel. The fundamental difference with the Renaissance wheel is the axle. 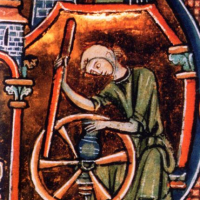 In the case of the medieval kick wheel, the axle is the only static segment. 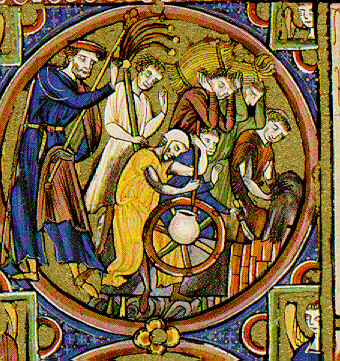 The wheel head, the spokes and the flywheel are all turning around it (image 23). 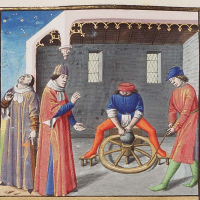 In the Renaissance wheel, the axle is fixed to the flywheel and the wheel head. They all turn simultaneously: the axle functions as a shaft. The construction around it keeps this whole moving unit centered. I started making sketches with the concept of a static axle in mind. I was curious if it was possible to make the entire wheel of wood. 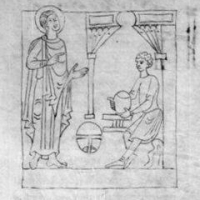 If this would be possible, I argued, it would probably be the cheapest and therefore the preferred design for a medieval potter. Version 1.0: In 2015, I had the first version of my reconstruction in motion, entirely made of wood. 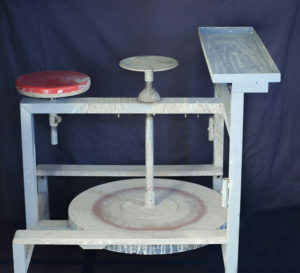 It functioned well enough for throwing small cups and bowls but the wheel wasn’t fast and stable enough to allow a potter to throw large jugs or dishes. It was clear that the wheel needed some improvements. 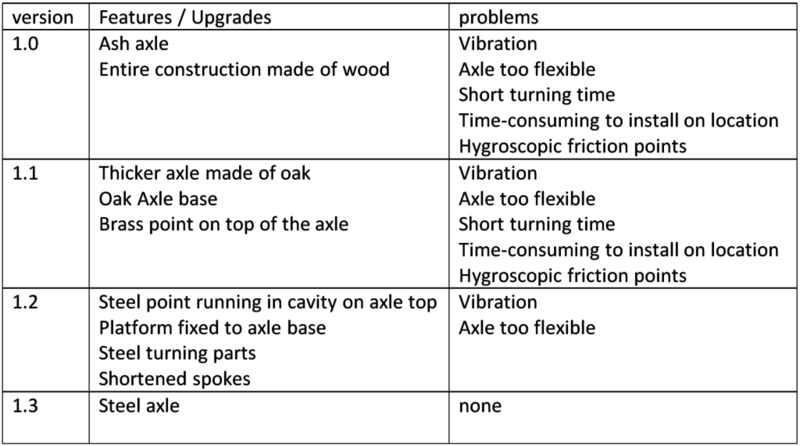 A brief summary of the problems and the solutions can be found in the table below. First of all, the axle was too flexible. The ash that I used turned out to be the wrong type of wood and it was definitely too thin. Version 1.1: I fixed a thick oak axle (5,5 cm diameter at the base) in a horizontal wooden cross to replace the ash axle. Compared to ash, oak is more rigid. The first metal part that I added was a brass point on top of the axle with a matching brass plate inside the wheel head. This pin was meant to concentrate all friction on top of the axle on a tiny surface to make the wheel run smoother. However, the brass point only worked for as long as it lasted: it wore down quickly. Also, the oak axle wasn’t sturdy enough. Version 1.2: The hygroscopic properties of the wood made it shrink and expand depending on the humidity. One time with moist weather, I could barely move the wheel because the flywheel was pressing onto the axle, while with dry weather, there was too much space between the axle and the wheel for it to run smoothly. I soaked the turning points in grease to prevent the wood from absorbing moist but this did not solve the problem. 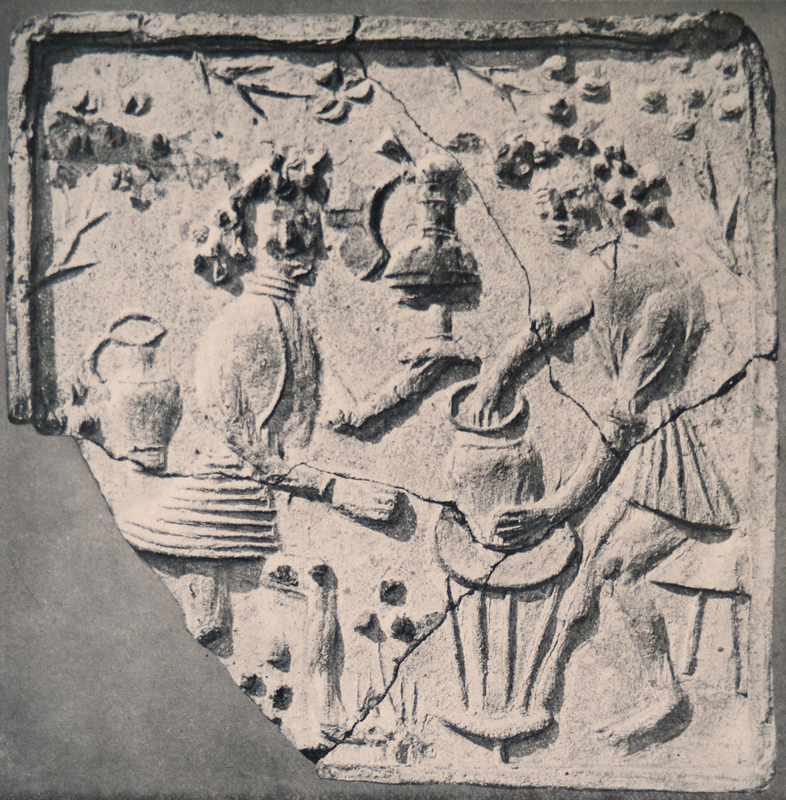 By that time I had paid a visit to the Töpfereimuseum Raeren in Belgium (Pottery Museum Raeren) where I acquired the publication: Raerener Steinzeug – Europaïsches Kulturerbe (Stoneware from Raeren – European heritage) by Ralph Mennicken. 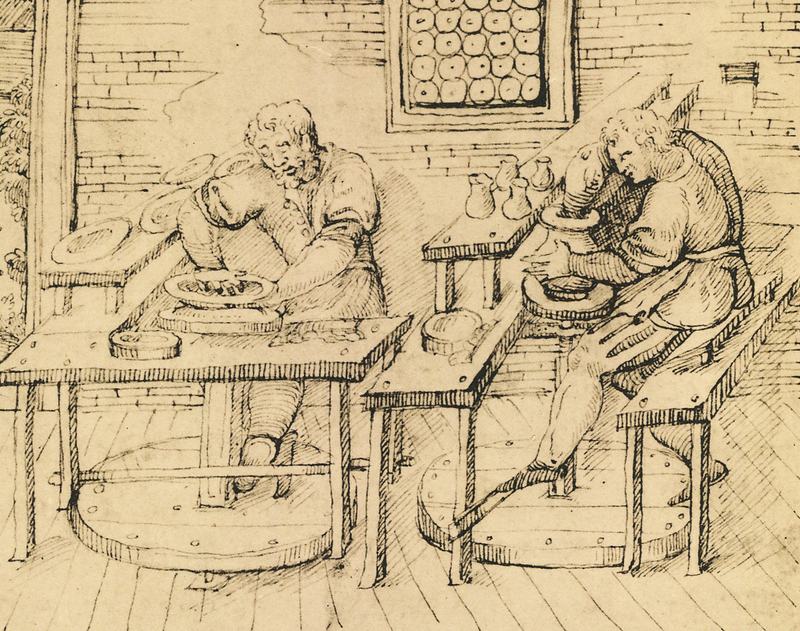 In this book, several drawn cross-sections of late medieval and post-medieval potter’s wheels are included. They did not only confirm the principle of a static axle but also gave me more insight into the additional steel parts. These parts would take away my problem of the expanding wood and reduce the friction of the wheel. Said illustrations are cross-sections of the cartwheel-shaped wheel. But since the dynamic principle of these wheels barely differ from the medieval kick wheel, I made all the following changes according to the cross sections in Raerener Steinzeug (1). A steel pin is pointing down inside the wheel head (image 25). The pin rests in a cavity on top of the axle that can be filled with fat or oil to prevent the steel from wear. The axle is encompassed in two places: at the wheel head and at the flywheel. Here, plain bearings are used: a metal tube around the axle with a corresponding metal tube that is fixed inside the wooden flywheel and wheel head. 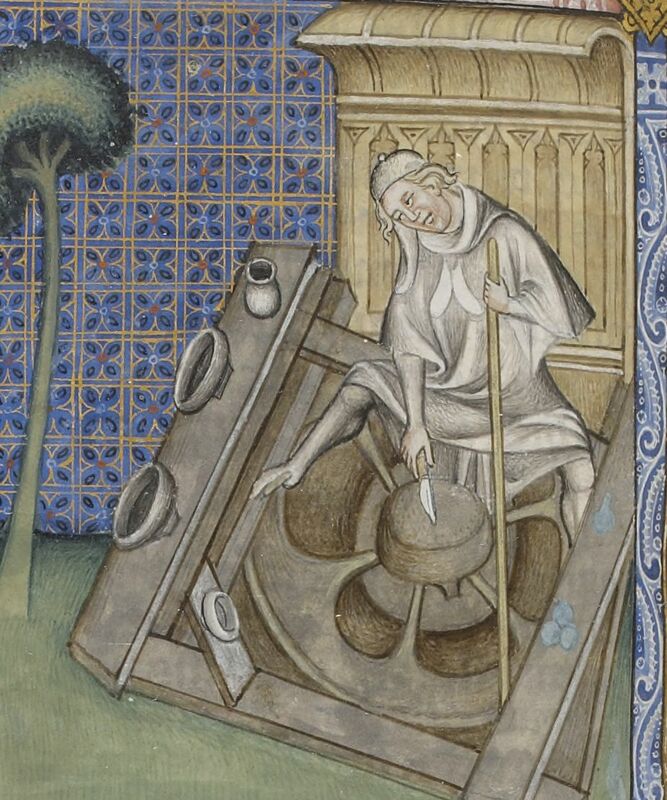 I also decided that the construction should be a bit shorter to correspond with the average height-width ratio of kick wheels on medieval and post-medieval images. To make this happen, I shortened the axle and the spokes of the wheel. 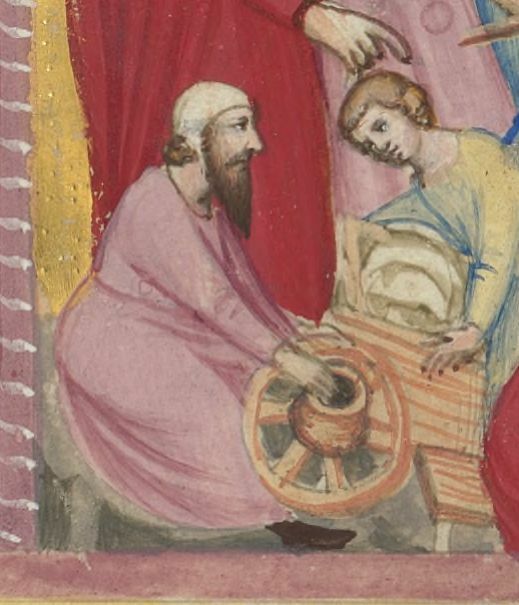 A third change was necessary to make the wheel mobile. 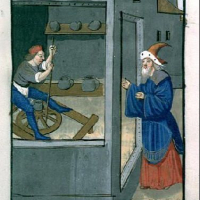 For a medieval potter, it makes perfect sense to secure the axle in the floor of the workshop. A potter could use rocks, beams and wedges to secure it. Foundations like these have been found in various archaeological sites. But since I started out to make this wheel for demonstrations around the Netherlands and beyond, I’m in need for a moveable wheel. 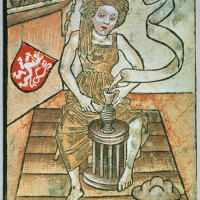 The image on the playing card from the Hofämterspiel (court employee game) from the Kunsthistorisches Museum Wien in Vienna (image 26) offered a solution. 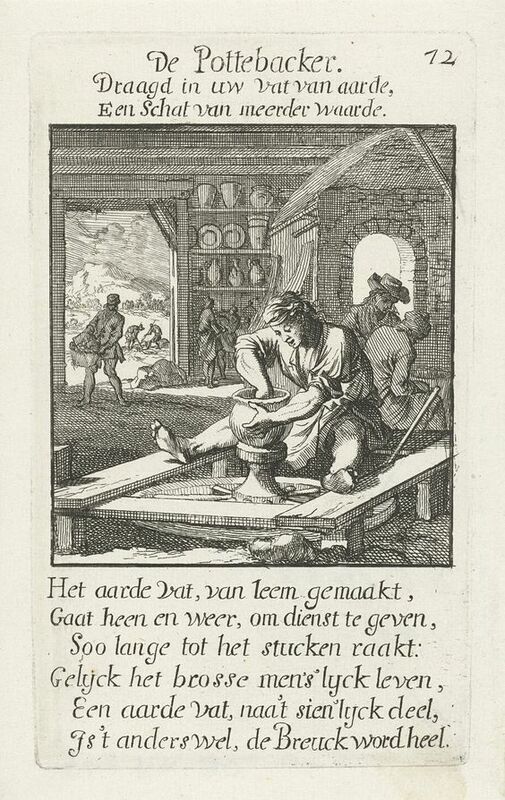 Here the potter’s wheel is fixed in a wooden platform. I had already secured the axle on an oak cross, now I fixed the wooden cross into a platform made of oak. This was a great improvement over the former situation, where I had to fix the axle in the ground by digging holes and hammering wedges on location. 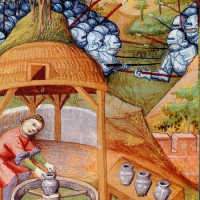 This excavation proved that a steel axle was affordable for at least some medieval potter’s workshops and that it seemed rewarding enough for those workshops to make the investment. Armed with this information, I fixed two metal tubes on the new steel axle that corresponded with tubes inside the flywheel and the wheel head. The metal axle (with a diameter of 3 cm) was a lot thinner than the oak one, but it turned out to be stiffer –the vibration was gone (final cross section image 25). In 2018, after these changes, I used the kick wheel during a residency of the Company of Sainte George in the Middelaldercentret in Nykøbing, Falster. There, the wheel worked properly for the first time (image 27). 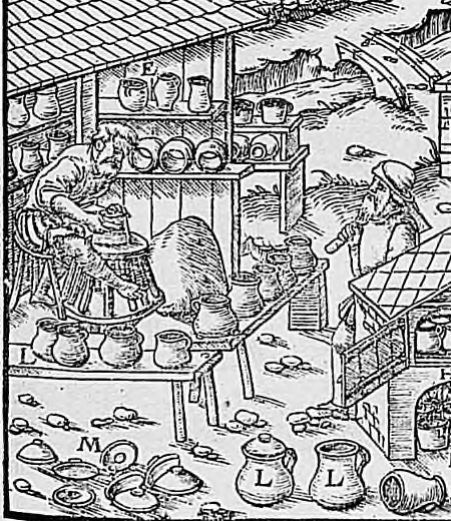 How was the medieval potter’s wheel constructed? We cannot tell exactly how. Some parts are invisible in the pictures and the additional information from excavations is limited. The shape and material of some pieces has to be guessed. However, kick wheels around medieval Europe might have differed from each other, so there are probably multiple right ways to reconstruct one. 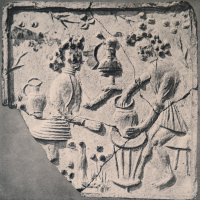 Contemporary images confirm a variety of shapes of the same type of wheel. It seems reasonable that the majority of the construction was made of wood. 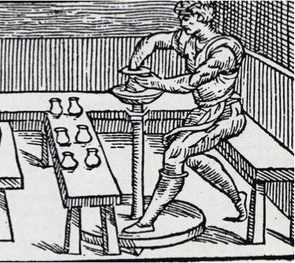 The medieval wheel had a static axle, in most cases fixed into the workshop floor. Sometimes the axle was installed below floor level, in a round pit. The excavations of potter’s wheels in Raeren point to a steel axle. If steel axles were a standard feature in medieval wheels can be doubted but my experiment does prove that steel parts can enhance the momentum and stability of a wooden wheel. Both the medieval cartwheel and kick wheel were lowered over the top of the static axle. They needed to stay centered and run smoothly at the same time. Grease was used to maintain the contact points. 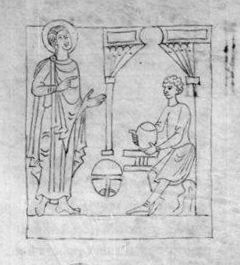 How would the construction of a medieval potter’s wheel influence its use? 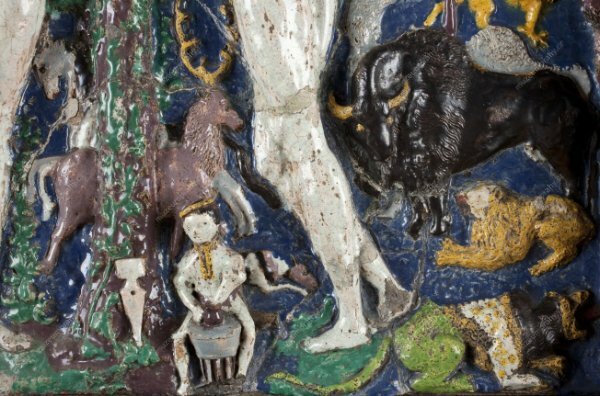 Some cartwheels were installed below the potter’s seat. 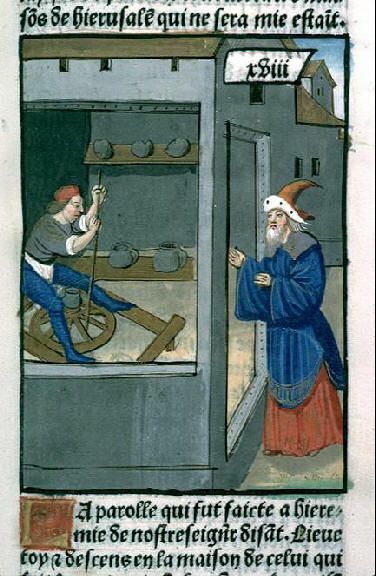 They could be made larger and heavier than kick wheels because the potter didn’t have to spread his legs around the wheel to put his feet down. The great weight would make for better flywheels: they could store more rotational energy. 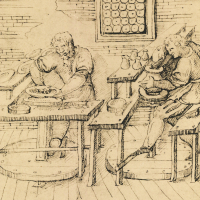 Sitting above the pot instead of in front of it had another advantage: the potter could use his or her bodyweight more effectively when forcing the clay into shape. Large amounts of clay that required some strength to center could be worked easier with these wheels. 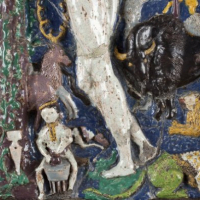 In some images however, the cartwheel is positioned in front of the potter. The previous advantages would not apply for those cartwheels. The downside of all cartwheels is that the potter needs to take his hands from his work to speed it up. The major difference with the cartwheel is that it’s moved with the foot instead of the hands. There is no need for the potter to grab a stick to power the wheel and that might speed up the throwing process. 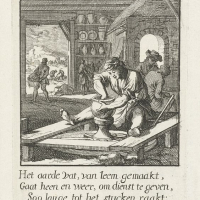 Although a potter usually doesn’t shape the vessel while kicking, bringing the wheel to the right speed with the foot might just take as long as moistening both hands for the next pull. Distributing the effort between hands and feet can also contribute to the comfort of the potter. We may conclude that the different constructions of the two medieval wheels make them more or less useful under different circumstances. 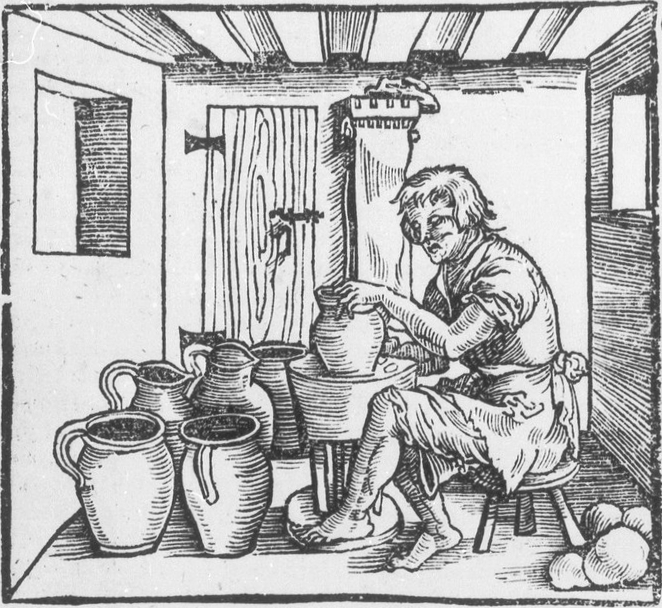 Medieval potters might have chosen one type or the other for such reasons. How does my kick wheel compare to its medieval ancestor? It turns out, the layout of my modern kick wheel is the same as the renaissance kick wheel and therefore more than 450 years old. 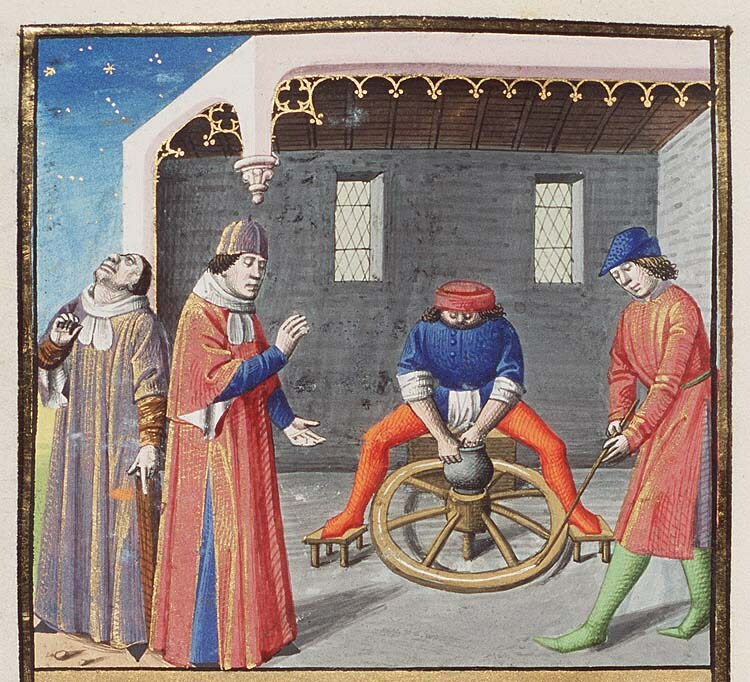 Of course, the Renaissance kick wheel didn’t have ball bearings and was largely made of wood. It is likely that steel was only used where necessary. 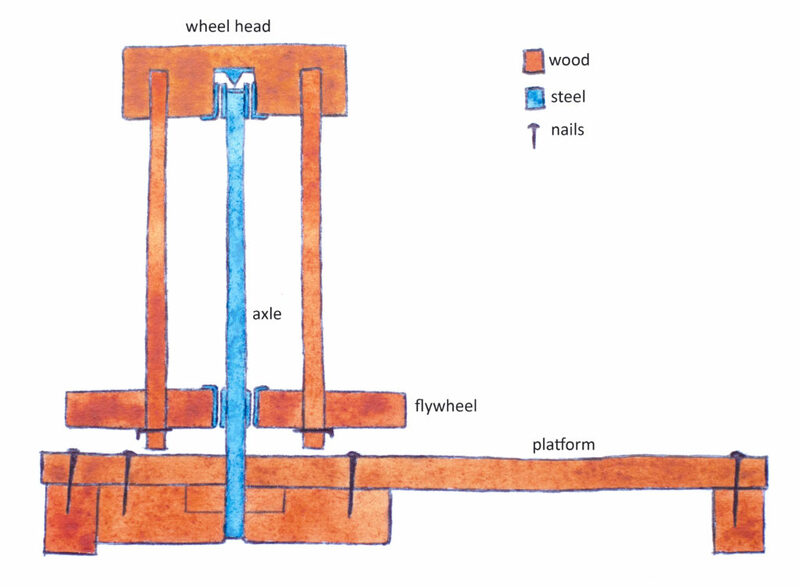 The layout of the medieval kick wheel is very different because of its static axle. Medieval kick wheels with the axle fixed in the floor couldn’t be moved easily in contrast with my modern kick wheel, which can be picked up and put down much like a piece of furniture. 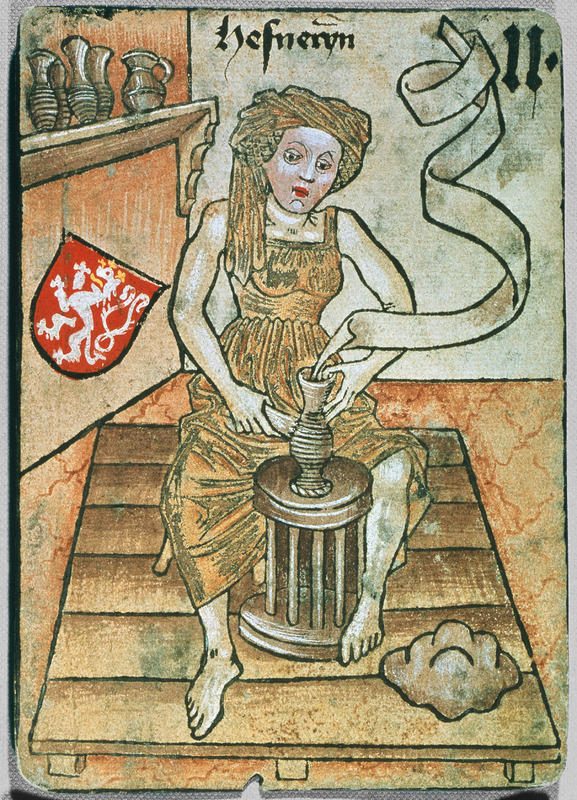 If the potter’s wheel on the playing card from the “Hofämterspiel” in Vienna points to a movable type of medieval kick wheel isn’t certain. 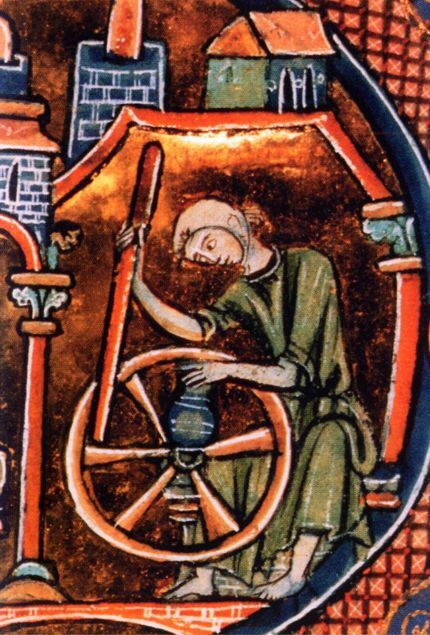 The medieval wheel was largely made of wood, where my modern wheel is almost entirely made of steel. 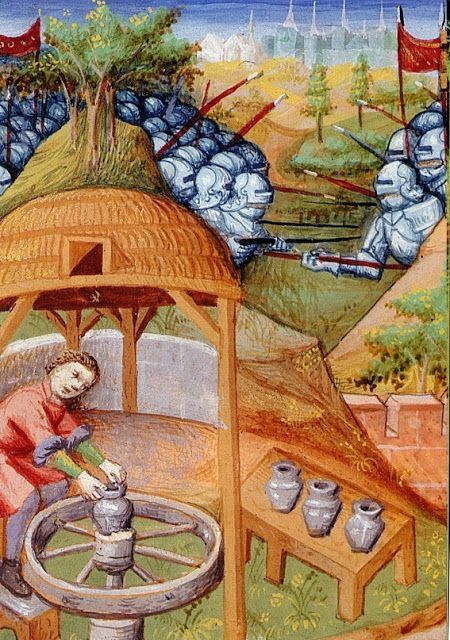 Steel was probably used in some critical spots of the medieval construction. However, none of these differences change the throwing process. The more I improved my reconstruction, the more it worked like my modern kick wheel. With version 1.3, there isn’t much to say about a difference in functionality anymore. Conclusion: my reconstructed medieval kick wheel does not influence the throwing process in any considerable way when compared to my modern kick wheel. This experiment proves that plain bearings, wood and grease can compete with the steel construction and ball bearings of a modern kick wheel. (1) Ralph Mennicken, Raerener Steinzeug Europaïsches Kulturerbe (Raeren: Grenz-EchoVerlag, 2013), 19. (2) Ralph Mennicken, Raerener Steinzeug Europaïsches Kulturerbe (Raeren: Grenz-EchoVerlag, 2013), 20. With the finishing of the brand new logo for Atelier Able (with many thanks to Studio Chalkboard – https://www.chalkboard.nl/) this website is ready to roll. There are still many images of past projects that need to be selected and uploaded, so more content can be expected soon. Also, this home page will function as a blog, with short texts about projects. My wish is, to spread knowledge about forgotten craftmanship and to teach people a bit about alternative ways of making and treating everyday objects – as a counterbalance to our throw-away society. I hope that in such a way, we might learn something from the past by acknowledging the great skill and knowledge of our ancestors.